I’m 15 years out of high school and finally I can call a cheerleader a good friend. My first memory of Christine Duffy is the back of her head – in particular, her hair. She was sitting in front of me on our first day of training in Philadelphia and it looked like she’d just walked off the set of a shampoo commercial. Her hair was gorgeous! Walking up and smelling it wasn’t the right move at the time, so I didn’t. We probably had one or two conversations for the first seven weeks of training. It wasn’t until we got our site assignments and we found ourselves as the only volunteers in our group to be placed in Surin when we became friends. Christine and I even work together now and then. 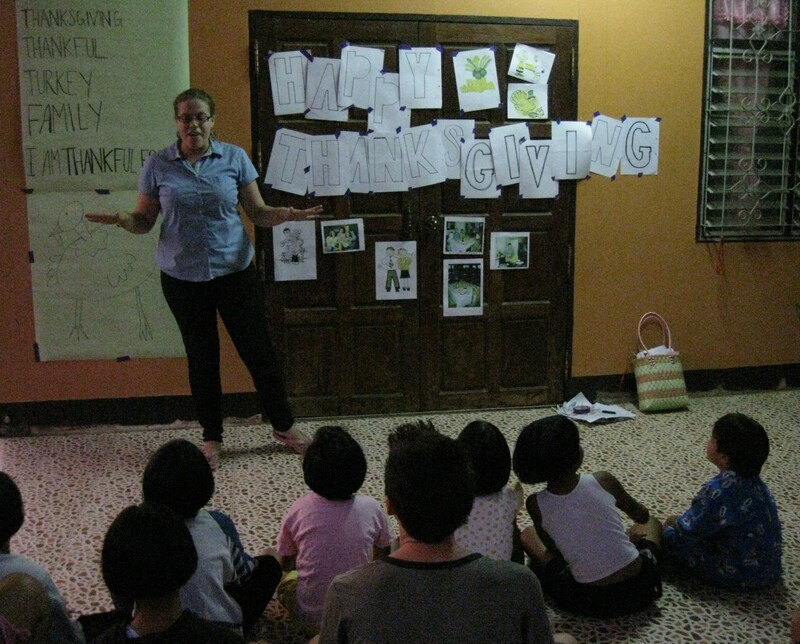 Here is Christine teaching her neighbors about Thanksgiving. We got to know each other on the bus ride from Bangkok to Buriram and then during the two-night site visit at another volunteer’s home. Since getting to our respected villages (about two hours apart), the city of Surin has been our town. We do our best to meet there once a month to unwind, have some beers and laughs. Rumors continue to circulate around Peace Corps Thailand Group 123 that we’re either a couple or are going to get married. We’ve both agreed we could do a lot worse, but it’s not like that. Of course, our Thai neighbors think we’re a couple when we visit each other since Thai men and women don’t interact unless they are together. On our first overnight trip to Surin, we did some major exploring – aka getting lost. We tried to find a Lonely Planet-recommended restaurant called Larn Chang. After searching for two hours, directions that pointed us in a new direction every time, two kind Thai women who took pity on us and gave us water and a tuk-tuk driver who looked like Reggie Jackson, we finally found the restaurant. We were the first to arrive and my language wasn’t working that day because every time I told our waiter we didn’t want another bottle of beer, he brought another. I’ve made far worse mistakes with my bad Thai. I thought this guy looked like Reggie Jackson. My mom thought he looked more like Ron Washington. Either way, he was the only one who knew where Larn Chang was. 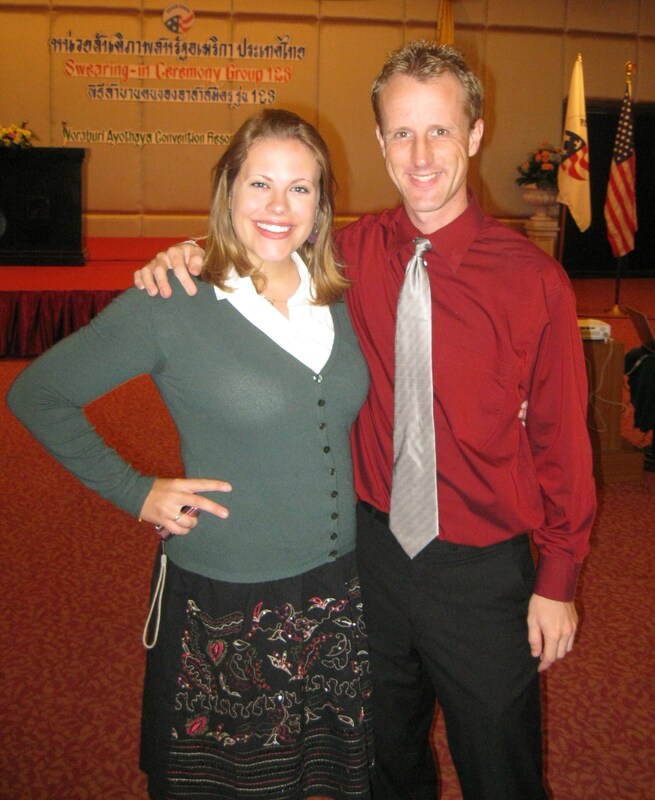 Christine and I have many memories together and we’ve only been in Surin for nine months. There’s no telling what the next 15 will bring. Christine put on a beauty pageant on Independence Day. On Christine’s visit home during the holidays she was featured in an article in her local paper. Check it out here. Also see profiles on Mark, Joe and Erin. This entry was posted in Peace Corps and tagged christine duffy, friends, peace corps, thailand by Jeff Jackson. Bookmark the permalink.